The motion trajectories of machine tools directly influence the geometrical shape of machined workpieces. Hence, improvement in their motion accuracy is required. It is known that machined shape errors occurring in numerical control (NC) machine tools can be compensated for by modifying the CL-data, based on the amount of error calculated by the measurement results of the machined shape of the workpiece. However, by using this method the shape errors cannot be compensated accurately in five-axis machining, because the final machining shape may not reflect the motion trajectory of a tool owing to the motion errors of the translational and rotary axes. In this study, a modification method of the cutter location (CL)-data, based on the amount of motion errors of the tool center-point trajectory during the machining motion, is newly proposed. The simulation and experiment of a wing profile machining motion is performed, to confirm the effectiveness of the proposed method. From the results, we confirm that the motion accuracy can be significantly improved by applying the proposed method. 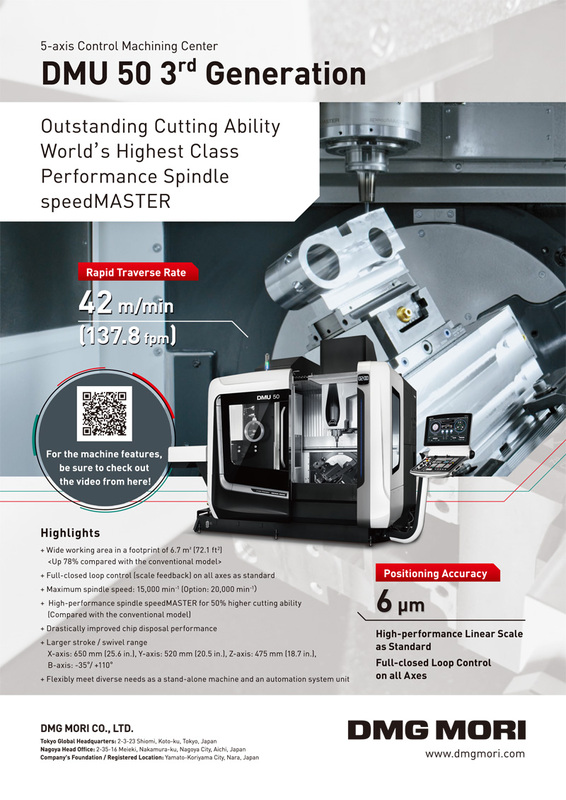 R. Sato, S. Hasegawa, K. Shirase, M. Hasegawa, A. Saito, and T. Iwasaki, “Motion Accuracy Enhancement of Five-Axis Machine Tools by Modified CL-Data,” Int. J. Automation Technol., Vol.12, No.5, pp. 699-706, 2018. R. Sato and M. Tsutsumi, “Dynamic Synchronous Accuracy of Translational and Rotary Axes,” Int. J. of Mechatronics and Manufacturing Systems, Vol.4, Nos.3-4, pp. 201-219, 2011. M. Tsutsumi, D. Yumiza, K. Utsumi, and R. Sato, “Evaluation of Synchronous Motion in Five-axis Machining Centers With a Tilting Rotary Table,” J. of Advanced Mechanical Design, Systems, and Manufacturing, Vol.1, No.1, pp. 24-35, 2007. M. Tomizuka, “Zero-phase Error Tracking Algorithm for Digital Control,” Trans. of the ASME, J. of Dynamic Systems, Measurement, and Control, Vol.109, pp. 65-68, 1987. R. Sato and M. Tsutsumi, “High Performance Motion Control of Rotary Table for 5-Axis Machining Centers,” Int. J. Automation Technol., Vol.1, No.2, pp. 113-119, 2007. P. K. Kulkarni and K. Srinivasan, “Optimal Contouring Control of Multi-Axial Feed Drive Servomechanisms,” Trans. of the ASME, J. of Engineering for Industry, Vol.111, pp. 140-148, 1989. C.-S. Chen and L.-Y. Chen, “Cross-coupling Position Command Shaping Control in a Multi-axis Motion System,” Mechatronics, Vol.21, pp. 625-632, 2011. Y. Koren, “Cross-coupled Biaxial Control for Manufacturing Systems,” Trans. of the ASME, J. of Dynamic Systems, Measurement, and Control, Vol.102, pp. 65-68, 1980. “FANUC Seriese 30i/31i/32i Operator’s Manual,” FANUC Ltd., B-63944EN, 2011. “SINUMERIK Tool and Mold Making Manual,” Siemens AG, No.6FC5095-0AB20-0BP0, 2007. “iTNC530 Information for the Machine Tool Builder,” DR. JOHANESS HEIDENHAIN GmgH, 363 808-2C, 2011. T. Otsuki, H. Sasahara, and R. Sato, “A Method for Evaluating the Speed and Accuracy of CNC machine Tools,” Proc. of the 9th Int. Conf. on Leading Edge Manufacturing in 21st Century (LEM21), No.034, 2017. C.-S. Chen, Y.-H. Fan, and S. P. Tseng, “Position Command Shaping Control in a Retrofitted Milling Machine,” Int. J. of Machine Tools & Manufacture, Vol.46, pp. 293-303, 2006. T. Miura and Y. Yamaguchi, “Machine Control Method, Published Unexamined Patent Application,” Japan Patent Office, H08-185211, 1996 (in Japanese). T. Ueguchi and S. Maekawa, “CNC Data Correction Method,” Published Unexamined Patent Application, Japan Patent Office, H09-269808, 1997 (in Japanese). M. Tsutsumi, S. Tone, N. Kato, and R. Sato, “Enhancement of Geometric Accuracy of Five-axis Machining Centers based on Identification and Compensation of Geometric Deviations,” Int. J. of Machine Tools & Manufacture, Vol.68, pp. 11-20, 2013. K. Erkorkmaz and Y. Altintas, “High Speed CNC System Design. Part II: Modeling and Identification of Feed Drives,” Int. J. of Machine Tools and Manufacture, Vol.41, pp.1487-1509, 2001. K. Nishio, R. Sato, and K. Shirase, “Influence of Motion Error of Feed Drive Systems on Machined Surface,” J. of Advanced Mechanical Design, Systems, and Manufacturing, Vol.6, No.6, pp. 781-791, 2012. Y. Sato, R. Sato, and K. Shirase, “Influence of Motion Error of Feed Drive Systems onto Machined Surface Generated by Ball End Mill,” J. of Advanced Mechanical Design, Systems, and Manufacturing, Vol.8, No.4, p. JAMDSM0044, 2014. ISO 230-1, “Test code for machine tools – Part 1: Geometric accuracy of machines operating under no-load or quasi-static conditions,” 2012.